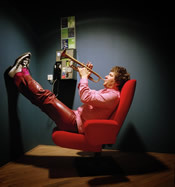 Regarded as one of Europe's best performers, chill and playful, Eric Vloeimans' trumpet playing captures the full range of the instrument, from brassy high notes to a reedy lower register, while his original compositions create an evocative, harmonic language of their own. With technique to spare, this disciplined acoustic trio includes Vloeimans, Anton Gooudsmit (guitar) and Harmen Fraanje (piano). "Our goal, as always, is to showcase the best of global culture here in Miami, and this concert fits right in with that vision," says Tigertail Executive Director Mary Luft. "Jazz is a uniquely American idiom, but it also flourishes in Europe, where musicians like Vloeimans are highly regarded." Eric Vloeimans has won numerous awards for his music, including the Dutch Edison Award four times and the prestigious Bird Award at the North Sea Jazz Festival. Season partners and supporters for our 29th season include: Allegany Franciscan Ministries; Arthur F. and Alice E. Adams Charitable Foundation; Audrey Love Charitable Foundation; BankAtlantic Foundation; Barefoot Wine & Bubbly; Biscayne Times; Books & Books; Bresaro Suites at the Mantell Plaza, The Children's Trust; City of Coral Gables Cultural Arts Program; City of Miami; City of Miami Beach Cultural Affairs Program, Cultural Arts Council; Consulate General of Brazil; Consulate General of Canada; Consulate General of the Federal Republic of Germany; Consulate General of France; Consulate General of the Netherlands; Dade Community Foundation; Dorsch Gallery; E.S. Moore Family Foundation; Florida Dance Association; Florida Department of State, Division of Cultural Affairs and the Florida Arts Council; Florida Literary Center; Foundation for Contemporary Arts; The Galler Group; Greater Miami Convention and Visitors Bureau; Grolsch; Locust Projects; Meet The Composer MetLife Creative Connections; MiamiARTzine.com; Miami-Dade County Department of Cultural Affairs and the Mayor and Board of County Commissioners; Miami-Dade County Public Library; Miami-Dade County Public Schools; Miami River Inn; National Dance Project of the New England Foundation for the Arts, with lead funding from the Doris Duke Charitable Foundation, additional funding provided by The Andrew W. Mellon Foundation, The Ford Foundation and MetLife Foundation; National Endowment for the Arts; National Performance Network with major funding from the Doris Duke Charitable Foundation, Ford Foundation, the National Endowment for the Arts (a federal agency), Altria, MetLife Foundation and the Nathan Cummings Foundation; Open Doors; Pridelines; Publix Super Markets Charities; Safe Schools South Florida; Shake-A-Leg Miami; The Sain-Orr Royak DeForest Steadman Foundation; Rain Vodka Organics; The Law Office of Linda M. Smith; Southern Arts Federation; Vortex Communications; WDNA & WLRN FM and our many private supporters.